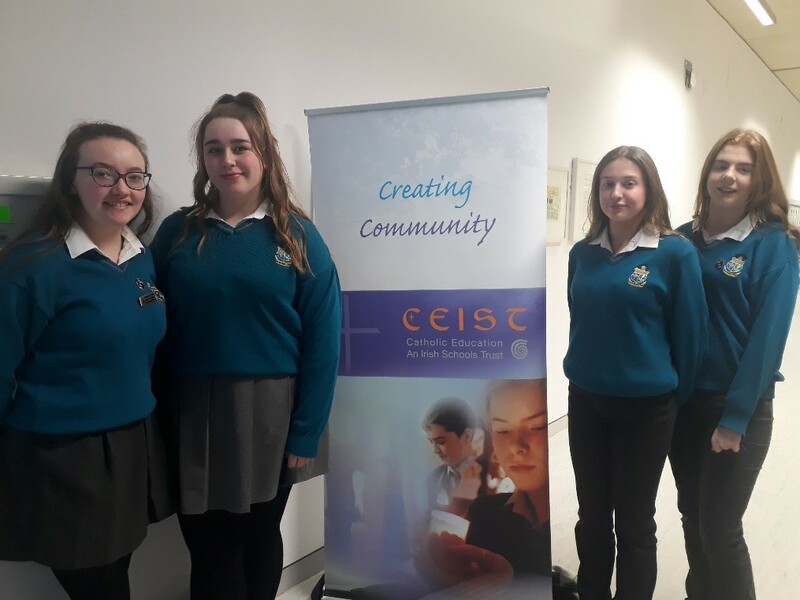 Congratulations to Sancta Maria College Fifth year students, Lily Kilcoyne Kellegher, Sarah Lyons, Laura O’Malley and Mia Warde who attended the CEIST Student Leadership Conference 2019 in DCU St. Patrick’s Campus, Drumcondra. Here is a brief outline of what the CEIST Student Leadership Conference involved for our students, Lily, Sarah, Laura and Mia. The day started with a welcome address from Professor Daire Keogh, Deputy President of DCU and Dr Marie Griffin, CEO Catholic Education An Irish Schools Trust (CEIST). This was followed by the lighting of the CEIST candle and opening prayer. Dr Diarmuid Martin, Archbishop of Dublin, gave his address and blessing. Students from St. Joseph’s College Lucan gave a presentation on The World Meeting of Families. Students then went to two workshops on Leadership and Well-being. They split into small groups where three schools gave presentations in relation to leadership and well-being and gave examples of how they have developed Leadership in their schools. The girls spoke of the positivity of being able to share inspiring stories and learn from others. Accompanying teachers participated in a mindfulness session. After lunch, Professor Daire Keogh, Deputy President of DCU, spoke about Leadership and how students as leaders in school shape the experience of school life. He inspired all students, “to be the kind of leader you would follow yourself.” Keynote speaker Mary Mitchell O’Connor, Minister of State at the Department of Education with special responsibility for Higher Education echoed this by urging students to, “reach for the stars and always try your very best.” She paid tribute to Catholic schools for the great work they have done for education in our country. Each CEIST school who volunteered for The World Meeting of Families were gifted with mementoes from the Papal Mass, which included two stoles for the sacramental chaplains to wear during school liturgies, two ciboria for distribution of Holy Communion and a copy of Joy of Love, all blessed by Pope Francis. Dr Marie Griffin said that this gesture from CEIST was for the inspiring volunteering work from all the schools present and the spirit of community on the day and weeks leading up to the visit of Pope Francis. Sarah Lyons represented Sancta Maria College as she collected the mementoes. Finally Sr. Assumpta from Mountbellew closed the events with a Scattering prayer. A great day was had by both students and teachers. We were all warmly welcomed and felt an integral part of the CEIST family and are looking forward to participating in future CEIST events.